Tajima beef is an original breed of renowned Kobe beef and Hon Matsuzaka beef. Such healthy and high-quality Tajima beef will be grilled on charcoal and presented by our chef. The sizzling sound of charcoal and juicy beef will arouse your appetite. It’s for sure that a casual chat with the chef enhances the taste of the beef. 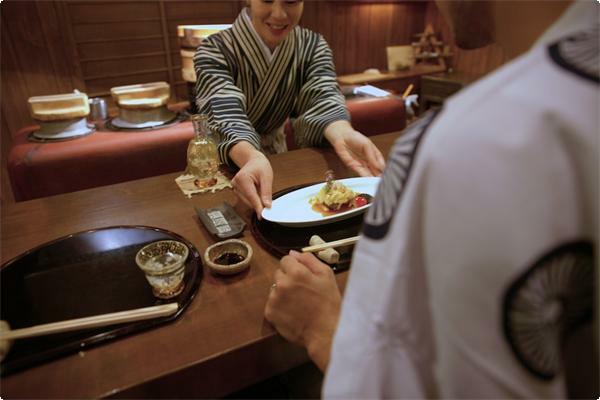 Dine in Kappo style; watching a chef’s performance over the counter. Feast on the main dish of charcoal grilled Tajima beef. Rice cooked on a Japanese furnace tops off your meal. Such a delicious and healthy meal will resonate with you. Our concept of breakfast is to satisfy guests to their heart’s content with our special rice of which we are proud. Includes grilled fish, fresh vegetables, black soy bean Tofu, Japanese pickles, cooked seaweed with Japanese pepper, pickled plums from Kishuu, and so on. Seasonal and natural side dishes will leave you hungry for more. Menu is subject to change according to the seasons and stocks. Various kinds of drinks are prepared.